Is the rogue life for you? When you first boot up Flinthook you’re blown away by an epic rush of colourful pixels and heavy chiptune synths. After this impressive intro, your expectations are understandably high for the game itself. 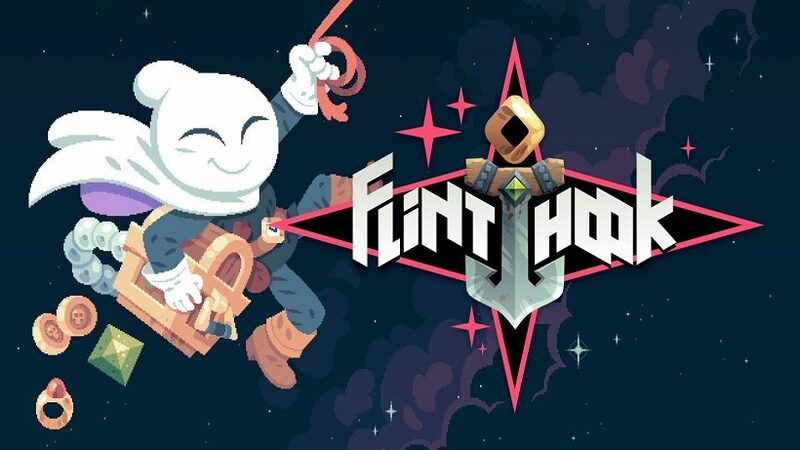 Whilst the presentation of Flinthook does follow through, it is just such a shame that it is so antagonistic to the presence of the player, causing you to question whether it is even worthwhile to continue. 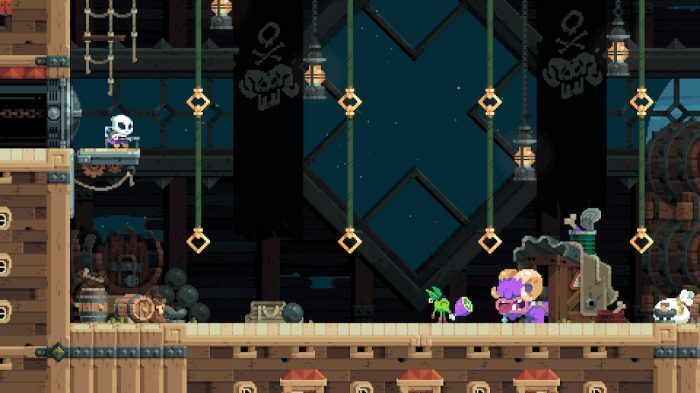 Flinthook gives the impression of being another pixel-based 2D action platformer, albeit with unique rope action abilities. Unfortunately, the game is heavily designed around the tropes of the roguelike genre, meaning that instead of carefully crafted levels for you to master, you’ll instead encounter seemingly random levels that are stitched together in no apparent order. Therefore, Flinthook is all about mastering the controls and mechanics, rather than understanding the design of the environment. Often roguelikes demand the player to die early on during their first few attempts; Flinthook is no exception. It would be wrong to single out Flinthook in this regard, as it is not unique to the genre, but the harshness seems out of place given the aesthetics of the game. A level requires the completion of multiple stages before finishing with a boss stage. But, die at any point in a level – including against a boss – and you have to start the whole level again. What’s more, the stages randomly reset. This is both a positive and negative move. On the one hand, it prevents multiple (which there will be many) playthroughs from getting stale, but it prevents you from learning the layout of the stages as well as there being instances of stages that will catch you completely off-guard. I would have put Flinthook down as being an exercise of “git gud”, but this would be antithetical given the randomness of the stages, you must rely on your reflexes instead of muscle memory. This is not a game that you can play in bed for a quick session before going to sleep, you can try, but it will be a wasted exercise. The other mechanic underpinning Flinthook is the perk system, this provides equipable power-ups that can be assigned to your character. However, you have limited, but upgradeable, capacity meaning you must carefully decide which perks you should apply. 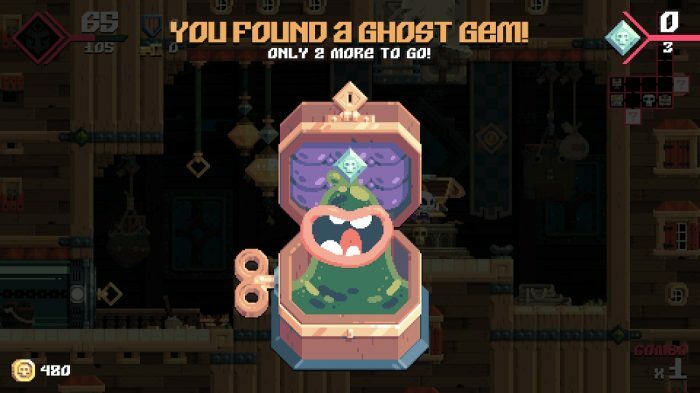 Given the lack of perks you can utilise at the start of the game, Flinthook purposefully punishes you and prevents you from moving further until you have earned enough resources and XP to equip additional and better perks. Whilst this does give some personalisation to how you can approach the game, the way it is implemented – at least early on – seems spitefully unfair. Despite these criticisms, Flinthook is not a bad game, it just makes few concessions for the player. The approach to player death – whilst still providing XP – seems unnecessarily harsh, especially for players who are short on time. Other recent games have been able to provide intense difficulty, despite simultaneously being accessible to a range of diverse players. Flinthook’s particular approach towards difficulty definitely won’t appeal to everyone, but there will certainly be those out there who will embrace this challenge. A charming pixel-based roguelike pinned down by its unfriendly approach towards player progression. 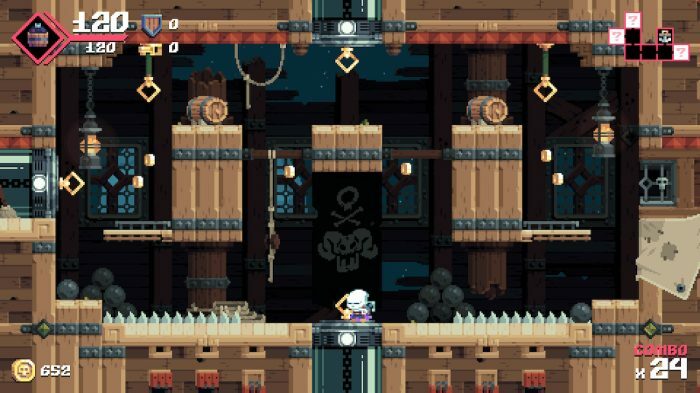 Flinthook will be rewarding for some, whilst providing controller-throwing levels of frustration for others.